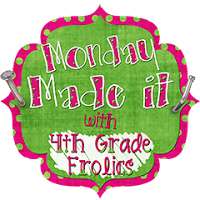 This week I have 3 Made Its to share for Tara's Monday Made It! 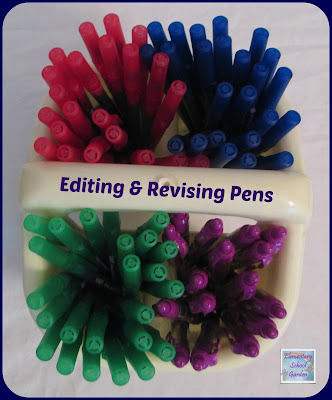 Each year I have students edit and revise their writing with different colored pens. They use blue to revise for word choice, purple to revise for details, red to edit for spelling, and green to edit for capitals and ending punctuation. This not only helps hold students accountable with the editing and revising process...but helps me as a teacher. I can easily glance over their work to see if they have really edited and revised. I found this cute container last year at the Dollar Tree. You can download the labels here. Last week I presented you with my Common Core Math Interactive Notebook pack for Place Value. This week I finished up a new one, for Metric Units of Measurement. Inside you will find all the materials you will need to continue a Math Notebook this school year with your fourth graders....focusing on Metric Units of Length, Mass, and Capacity. I have provided samples of what each page in the notebook could look like to introduce the various Common Core standards, as well as the necessary materials, foldables, clipart, and cut-outs that students will need to assembly their books. All of my Notebook Packs are going to follow the math modules found on the Engage NY Website. You can download their math modules for free. Only some are posted now. They should all be posted in time for (New York's) school year. Look for a new, Common Core aligned, Interactive Math Notebook for each math module. I will continue creating these resources as each module is posted on the Engage NY website! Finally, I've created a Facebook page. Or, at least I think that I have created a Facebook page. I can access it from my cellphone but for some reason I keep getting prompted to go through the set-up screens again every time I try to access it on my computer. The last screen always being a blank one when it comes time to "reach more people." I can see it on my phone though so I'm guessing the page exists. I also have a few friends already liking it so that is a good sign. Any one else have any trouble creating a Facebook page recently? Am I doing something wrong? I guess this made it is a made it in progress! 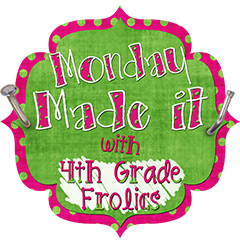 Check out all the other Monday Made It's on Tara's blog, 4th Grade Frolics. I love, love, love the pens idea! I think I need to do this! I really like the idea of revising and editing in different colored pens. This is a great time of the year to find a variety of colors. Thanks for the tip! Your Facebook page is definitely working. I can see it and it looks great! That pen caddy is AWESOME! Such a great idea and it looks good too! I love your math detective units! I have added them to my TpT wishlist. Love the idea for revising and editing. The different colors will help students focus on each step! I'm definitely using this. Your pen idea is so smart! My kiddos would love that. Great thinking! LOVE the pens. My class does "Rainbow Revising". We've always used colored pencils, but I hate it when they use dull, thick pencils. It's so hard to read. The pens would solve that and be brighter and more fun to use. 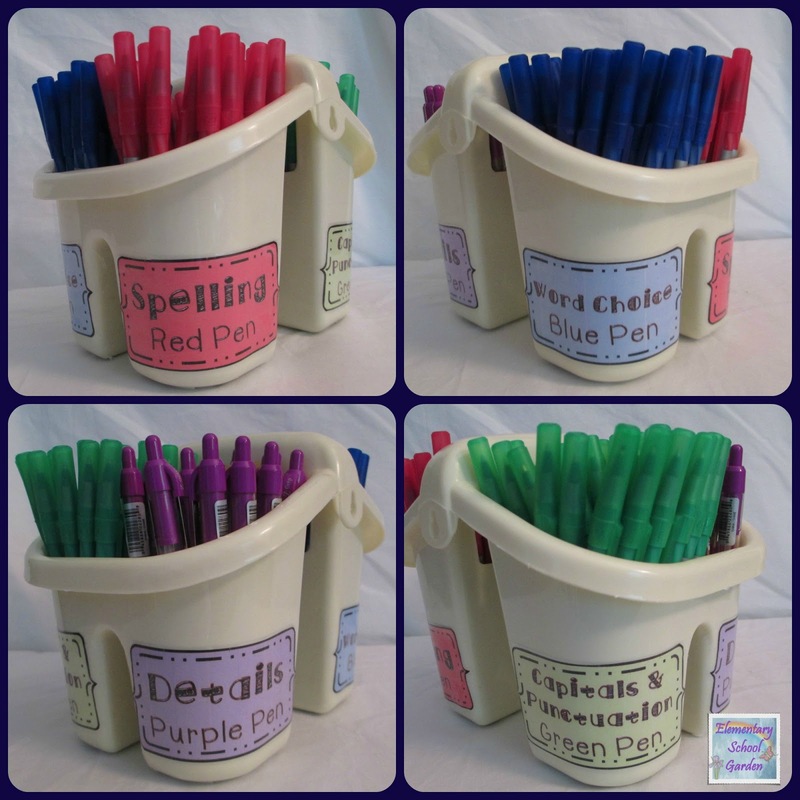 I use color pens for these steps too and the students love them. Thanks for the reminder that I need to start looking for some good sales on colorful pens! Time is closing in! Thank you for sharing your brilliant revising pens idea and labels! Your creativity has inspired me!